Scientists say they’re stumped and surprised by a new discovery on the surface of Ceres, a dwarf planet that lies in the asteroid belt between the orbits of Mars and Jupiter. Observed by NASA’s Dawn spacecraft, new data suggests the space rock is home to several unexplained bright spots, along with a three-mile high pyramid poking out of the protoplanet’s surface. Sounds like some alien ritual sacrifices are taking place. Ceres is considered to be a “fossil” from the early solar system, which is why NASA’s Dawn spacecraft is so eager to get a closer look. By studying the enormous rock up close, scientists are hoping to get a better understanding of how the vastness of space came to be. Speaking to the LA Times, Christopher Russell, Dawn’s principal investigator, said he never dreamed of discovering bright spots—and he has no idea what that pyramid might be. A geographical anomaly is the most logical answer, but scientists can’t be sure. Ceres was initially thought to have fairly smooth terrain, but this latest data suggests that’s just not true. 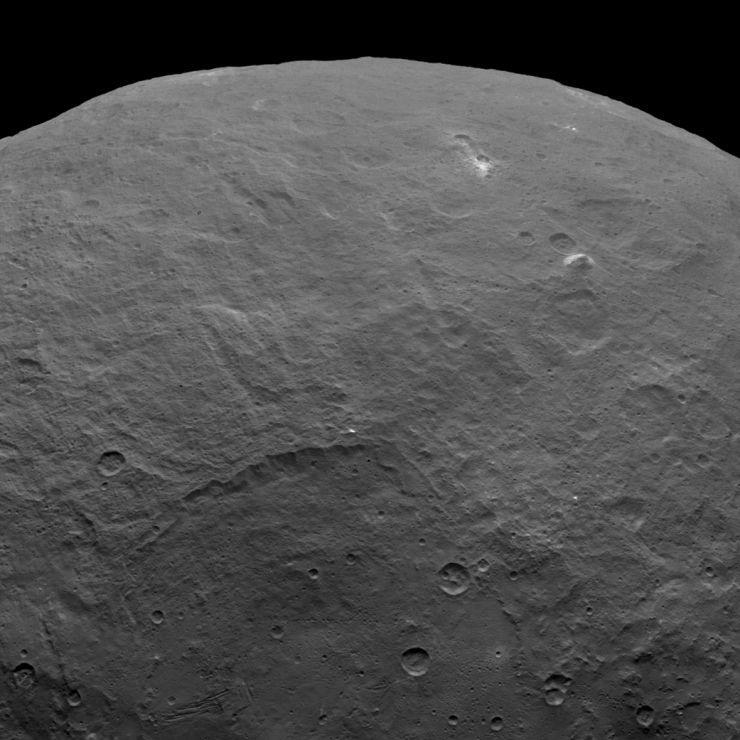 The fact that there’s a pyramid-like protrusion hints the dwarf planet holds many more mysterious than previously anticipated. And those bright spots? It’s complicated. At first, NASA’s Hubble Telescope spotted what looked like a single bright spot; as Ceres got closer, scientists realized there were two bright spots. But as Ceres got even closer, it was clear there were at least eight spots, which scientists believe are either salt or ice. 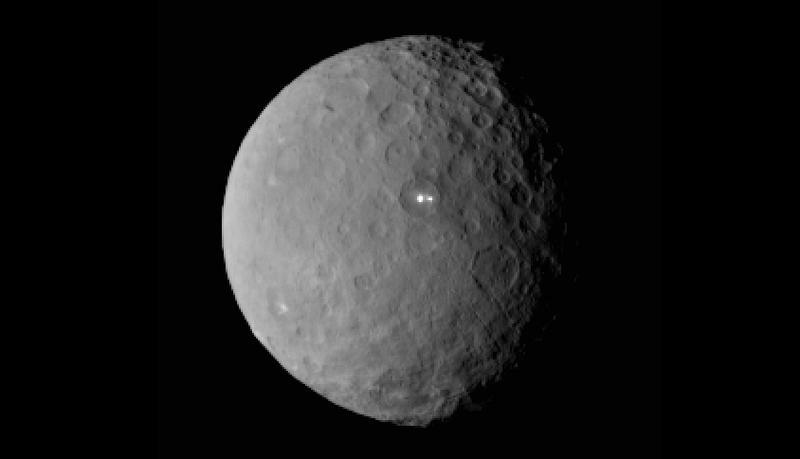 Russell said a definitive answer should be known once Dawn passes over Ceres again this August. 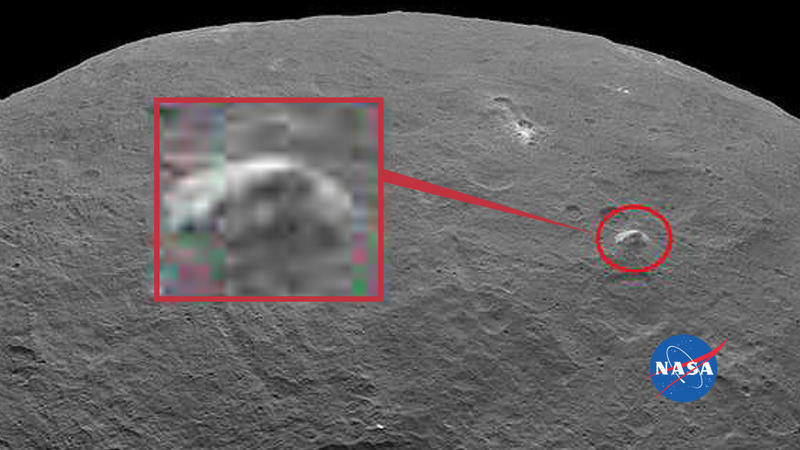 Early last year, scientists discovered evidence of water on Ceres in the form of vapor plumes. That, along with the bright spots and gigantic pyramid makes for one of the bigger space mysteries in a while. We should know more once Dawn gets a closer look later this summer.